Electronic cat toys are the easiest way to keep an overly feisty cat in control. In fact, if you have been watching episodes of My Cat From Hell, you probably already know how important regular playtime can be with our furry friends. Of course, these toys have to be the right quality, because even cats can get bored with toys if they feel like they are dull. Here are 5 electronic cat toys we believe every cat owner should try out with their favorite furball. Let your kitty enjoy the thrill of the hunt! This simple little toy from Petlinks turns playtime into a BBC wildlife documentary. You can set the speed (slow, medium, fast, random), but then it’s like there’s a real mouse loose in the house, and your cat will lose its marbles defending its territory. It’s also incredibly mysterious, since all your cat will see is some sort of tail. What could it be? Super fun! Just needs a few batteries. 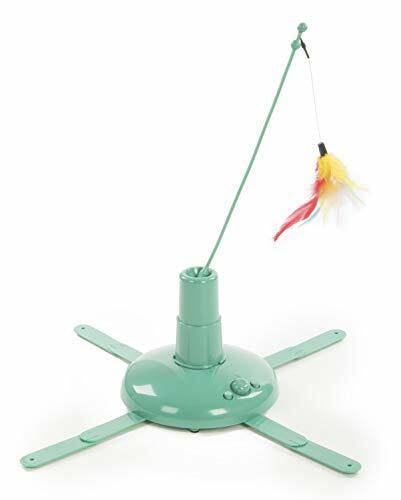 The SmartyKat LocoMotion Automated Activity Cat Toy is actually very, very similar to the Cat’s Meow Motorized Cat Wand Toy in a number of ways. Both of them are basically motorized wand toys that spin in a random direction and change direction. However, the difference between them is that this one does not make an effort to mimic a mouse crawling on the ground. Instead, the SmartyKat is an electronic cat toy that mimics a bird with it’s higher elevation dangling feathered cat toy. This one can prove to be a little bit more of a challenge than the Petlink, and it also will appeal to cats that just simply like to hunt birds instead. We really do enjoy its long battery life, and the fact that it’s basically noiseless. This also double as a cat exercise machine since it has adjustable speeds, so chubby kitties will definitely get some much needed workout time. #3 – No products found. Do you have a passion for aesthetically beautiful objects, and just can’t have an ugly electronic cat toy in your home? If so, then the FroliCat DART TR1 is a wonderful pick. We haven’t seen an electronic cat toy look this sleek – ever. It’s like if Apple made cat toys. It’s an automated laser cat toy, which means that it will provide hours of the fun and excitement your cat enjoys – chasing things like a maniac and looking surprised. The DART TR1 has a lot of different perks that make it one of the best automated laser electronic cat toys we’ve seen. 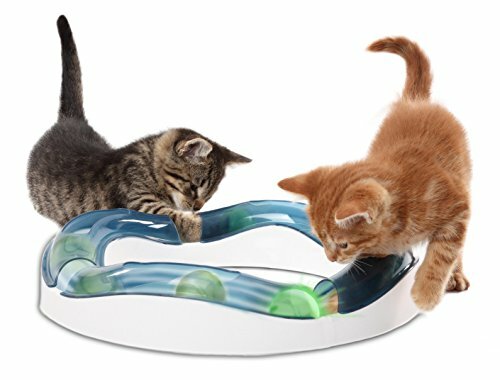 360 degree swiveling, 16 different play programs, and an adjustable timer make it the perfect toy for busy cat owners who want a “set it and forget it” deal for their cat’s play time. And, we really can’t get enough of how pretty this cat toy looks. Cats have a need to hunt, and this goes doubly so for former barn cats. 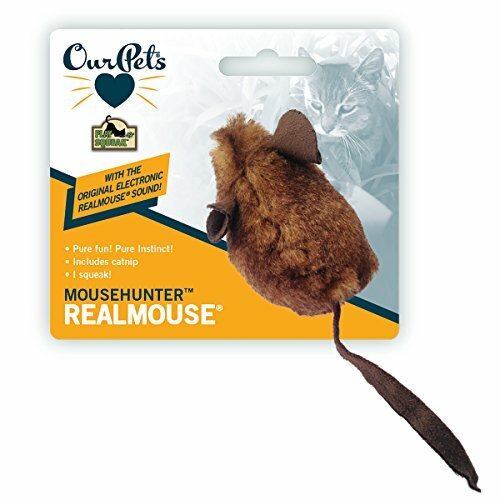 The Mouse Hunter is an electronic cat toy that looks like a mouse, has a built in squeaker that squeaks like a mouse, and even feels like one. This toy is an excellent pick for cats that need to have their base instincts appealed to. 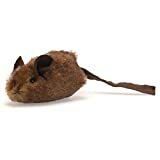 From what we’ve seen, cats really, truly prefer this one over the “normal” mouse-shaped cat toys you see in discount stores. And, to be fair, the squeaks are very cute. The battery life is decent, and it’s a low cost toy. What’s there not to love with this simple, instinctual treat? The Hagen Catit Design Senses Play Circuit definitely is one of the largest electronic cat toys to have made this list, and it’s also one of the longest. This long tube is outfitted with several peekaboo holes, and a light up ball that just makes cats go crazy. It’s all motion activated, so you can definitely expect to see your cats ears perk up and their eyes go wide as soon as they take their first look at the toy. The reason why we really enjoy this cat toy design is because there’s actually a lot of thought put into it, and you can see it in the subtleties of the toy itself. You can choose from several different layouts that you can build yourself, making it easy to give your cat a little more variety in their daily play. The peekaboo holes might seem pretty standard but in fact are placed strategically in places that are easily visible, yet a little harder to reach. The ball itself is covered in colorful swirls designed to cat cats’ eyes. And of course, it glows. Things that glow are awesome for cats and people alike! Each of these toys is fairly different from one another, and in many ways, that actually reflects the different personalities that cats can take on. The fact is that any electronic cat toy in the market today has the potential to be your cat’s favorite toy, and that each cat has his own preferences. 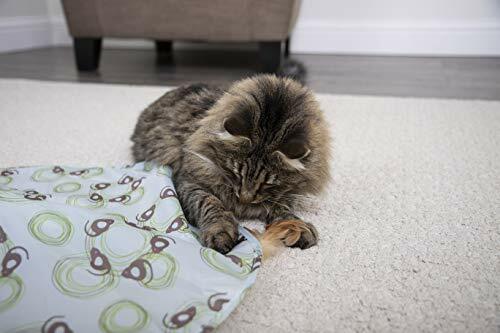 In order to make the most out of your cat toy money, it’s a good idea to experiment with “analog” cat toys so that you can see which digitized version would most likely entertain your cat.